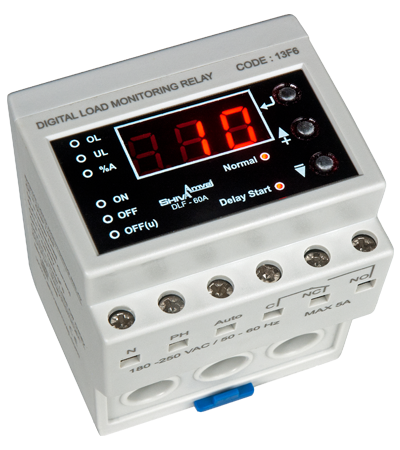 Shiva Amvaj Digital Load Monitor Relay utilizes the latest technologies and a microprocessing unit for extremely accurate control of the disruptions caused by current asymmetry and over/undercurrent. It is suited to industrial applications and does not require a CT. the device comes in two models: the 1-60A and 0.5-15A models respective accuracies of 1A and 0.1A. setting UL to zero disables undervoltage mode. 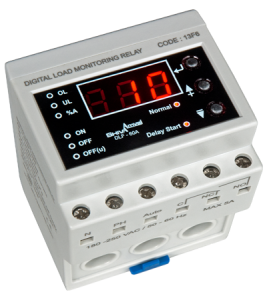 Initial start time indicates the time after relay connect and current conduction during which overcurrent (for initial motor start) does not factor in.